Today at Sentosa, the Tongkat Ali were blooming and fruiting! Tongkat Ali (Eurycoma longifolia) has a notorious reputation as a purported aphrodisiac. The ITE team on this trip broke out in knowing smiles when I pointed out the plant. Tongkat Ali is a small tree or a shrub with an umbrella-like rosette of leaves at the tips of the branches. The leaf is made up of 45-80 leaflets. The tiny, hairy cup-shaped flowers are purplish-crimson, and according to Corners, with a slightly foetid smell. Male and female flowers are found on different trees. These turn into oval fruits that ripen yellow then red. The tree has many traditional medicinal uses. According to Corners, the bark and especially the roots are 'exceedingly bitter' and the bark was used as one of the native remedies for malaria. According to Burkill, the bark is also used in a tonic for after childbirth. It is also pounded and used externally for headaches, wounds, ulcers and sores. Unfortunately this plant is listed as 'Critically Endangered' on the Red List of threatened plants of Singapore. 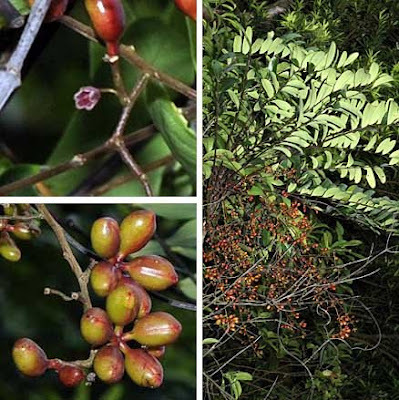 Elsewhere, the plant is also threatened by over-collection for the traditional herbal trade. According to Hsuan Keng, it was previously found in primary and secondary forests including Tanglin and Bukit Timah. According to Burkill, its distribution is from the Gulf of Tongkin to the Malay Peninsula and Borneo and Sumatra. Wikipedia reports that "Tongkat ali is one of the most expensive herbals sold internationally. The market demand for Tongkat Ali is growing, and even though plantations are being created every year, demand still outweighs supplies. Trees in their native habitat are rather scarce, and are further endangered by the common practice of wild harvesting." On About.com's page on alternative medicine. On Drugs.com which indicates there is no clinical evidence of the effects of Tongkat Ali. On the Bogor Botanical Gardens site: description of the plant and threats to it from the traditional herbal trade.